Marketers have long thought about the emotions of their customers in relationship to selling products or service. However, human beings respond to all written information with their emotions. In fact, we use our emotions to make decisions and then maybe use data to support those decisions. This fact is true whether a customer is reading a bank statement, a marketing brochure, or terms and conditions for a credit card. Those of us who create content need to understand the types of emotions that engender trust and loyalty and how to write content that reinforces those emotions. Join Scott Abel, The Content Wrangler, and Deborah Bosley, Ph.D, Principal of The Plain Language Group, for this free one-hour webinar. 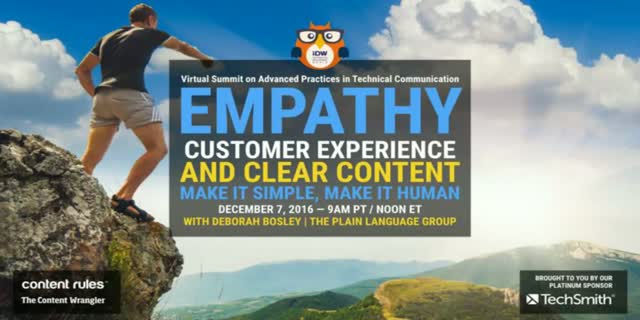 Deborah will explain the connection between emotions and language and offer examples of content that empathize with customers to create true relationships and vital customer experience.